Provided photo Terry Burr of Troy, grand prize winner of the 4th Annual Rockin’ River Duck Drop was awarded at check for $1,000 on Tuesday. The Duck Drop was held in Piqua’s Lock 9 Park on Aug. 18. PIQUA — Terry Burr of Troy was the grand prize winner of the 4th Annual Rockin’ River Duck Drop held in Piqua’s Lock 9 Park on Aug. 18. Burr was awarded a check for $1,000 on Tuesday. Duck Drop committee members Debbie Stein, Lisa Whitaker (chair), Robin Heintz, Bob Greaser, Courtney Denning, Cathy Oda, Peggy Henthorn and Lorna Swisher were on hand for the presentation, along with Scott Rasor of Unity National Bank, the Top Duck sponsor of annual Duck Drop. Burr’s duck was first of 1625 ducks to finish the race. The second place prize of a $500 landscaping makeover donated by Lillicrap Mulch & Timer was awarded to Joe Teach. The third place prize of a $250 shopping spree at Barclay’s Men’s Women’s Clothier was won by Scott and Kim Miller. The last and lazy winner was Dan French. The last place award will get a rocker/recliner donated by Town and Country Furniture of Piqua. The Rockin’ River duck drop was also supported by Ticon Paving, A.M. Leonard, PSC Crane & Rigging, Crayex and the Miami Valley Centre Mall. 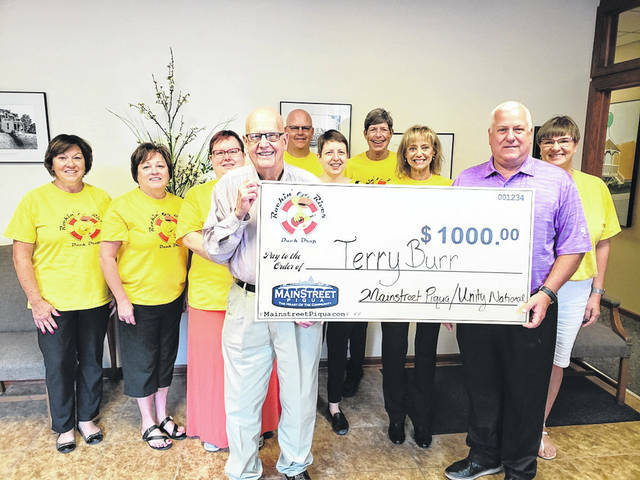 https://www.dailycall.com/wp-content/uploads/sites/30/2018/08/web1_winner-pic-2018.jpegProvided photo Terry Burr of Troy, grand prize winner of the 4th Annual Rockin’ River Duck Drop was awarded at check for $1,000 on Tuesday. The Duck Drop was held in Piqua’s Lock 9 Park on Aug. 18.